When working with larger SQL Server databases that contain thousands of objects, finding a particular one can be a difficult and time-consuming task. Likewise, when working with an unfamiliar database, it can be hard to locate specific keywords and snippets of SQL code. 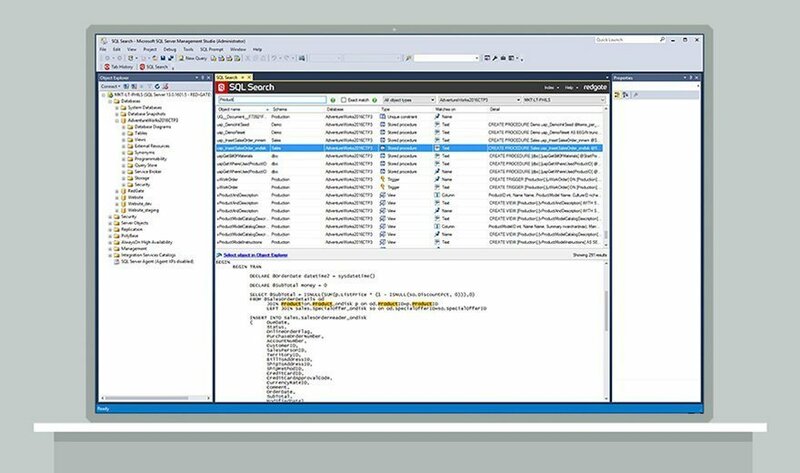 Microsoft's SQL Server Management Studio (SSMS) software doesn't offer the powerful and deep search capabilities that are built into Redgate SQL Search, a free add-in for SSMS. Redgate SQL Search enables DBAs to find all the references to a database object in a SQL Server system and quickly navigate to that object. To make that happen, Redgate SQL Search can be used to look for specific T-SQL code or text comments within tables, stored procedures, functions, views and other database objects. What experience have you had with Redgate SQL Search and similar tools?